Love this watch. Prettier in person. It looks great casual or dressed up and it’s big but doesn’t overwhelm my wrist. I would Recommend it if you are looking for a fun watch. 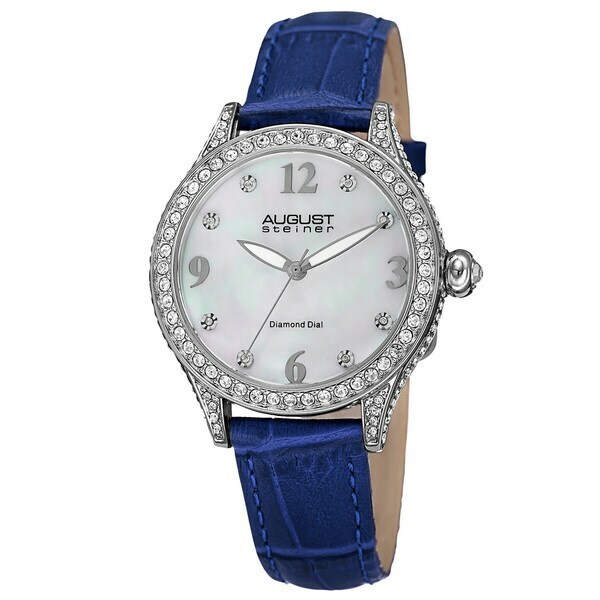 This August Steiner women's watch showcases an alloy case studded with Swarovski crystals. The MOP dial shimmers, enhanced by genuine diamond markers. This watch is powered by a reliable movement and completed with an alligator embossed leather strap. Very Beautiful watch. So glad I got this watch. The blue band really stand a out and adds a nice touch to the watch. Good quality and love how there are diamonds around the face of the watch and on the side. Adds a nice touch to the watch. Beautiful! Wife is extremely happy with her new watch. Arrived on time and no damage. One negative: the watch was inside the case and the case was inside of a small cardboard box that was not taped shut. I purchased this watch and one other from this website bc I'm looking for a blue watch. I much preferred this one because the details of the watch are amazing! Really happy with it! I'm returning the other. I would highly recommend this watch! It was the color I wanted and I love the Swarovski stones. The bonus Swarovski bangle was amazing. Beautiful watch. Only problem was that it looks like it was resold when we got it. The strap was worn in and packaging not nes. Not all the tags were attached. However it still looked nice. The sides of the watch looks cheap. Too bad cause the front was nice. I needed a navy blue watch and this one caught my eye!